Cherry Obsidia - Ramblings and Randomity: TADAAAAAA! 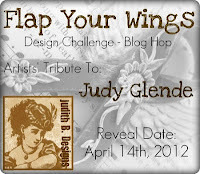 5th Bead Soup Blog Party - THE BIG REVEAL! One of my buddies on Facebook mentioned a new party starting and so I ummed and aahed and generally dithered about a lot. Then I submitted a request to join. When I realised I had been chosen my heart was in my throat - there is so much talent out there, how could I possibly be good enough!? I FORGOT TO USE THE FOCAL BEAD!!! Oops. Onto piece number two. The focal, an outstandingly pretty crystal open oval was too nice to overwhelm, so I went for simple, adding a little wire, a few leftover beads and a little leather, along with the pretty little crystal clasp from the original soup. The resulting necklace is now called 'Watery Pallette', because that's what it involves! And there you have it! 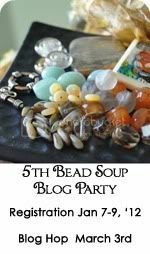 The 5th Bead Soup Blog Party has been fun, inspirational, challenging, but above all...has allowed me to view the work of some amazing designers who I may not have had the opportunity to see before, and I am thrilled to have been involved! So...I raise a metaphorical glass of something pink and fizzy to all involved in this one - and hope to see you all again at the next party!!! wow! that cuff is awesome! wow!!! Thanks Kashmira, off to do so now! You have every right to be proud of your cuff. Its gorgeous! You did a great job of rising to the challenge! Great work! Lovely beads and a beautiful use of them! Well done! Wow - those are gorgeous! I don't know why you would ever have been intimidated! Well done you - lovely cuff! That bracelet is amazing. It must have been a lot of work but certainly looks worth it. I'm a partecipant from Italy, I'm trying to visit all of you. this was really a great experience! That's your first bead woven piece? You'd never know it - the cuff is awesome! LOVE love love that cuff, how many hours did that take? It's stunning! You should be uber proud of yourself that came together really well. The bracelet is gorgeous, as is the necklace. I've been guilty of getting so excited about something I've forgotten to use a component -- in fact, during one mailing, I forgot to send a clasp! I hope you'll join me again in the summer! You should be proud of yourself the cuff is amazing!! Great job! so funny...waiting til the last minute. ME TOO! Sometimes the muse re-appears just when we need her. thank goodness. I'm amazed that you have never made a bead-woven piece before, and you nailed it on the first try! You should be proud of yourself. I love both pieces. I can see why you are proud of your woven piece. I love the colors, and texture of it. The clasp and how it is attached is very pretty. That cuff is fab -- congrats on making your first original bead-woven design! It looks great. Outstanding! Beautiful work. I felt the same way you did at first also. I guess that's a normal human reaction! You came out on top that's for sure! Very lovely cuff. Looks so flexible and glamorous. You shouldn't be intimidated by anyone. I would wear that cuff in a minute. That bracelet is to die for! I can't believe it was the first time you had something like that. I really love the necklace! The bracelet looks like a lot of fun to wear. So glad you're happy with your bracelet. You're enthusiasm really shines through. Beautiful bracelet and a very pretty necklace too. I love the color combination, it's one of my favorites. That looks like a lot of tedious work in the bracelet! Very nicely done! I love the colour combination of your pieces. That bracelet is stunning. It reminds me of a caterpillar or some sort of sea creature. Wonderful work! What wonderful pieces of jewellery you made! The bracelet must have taken you ages. I can't believe you've never designed a bead woven piece! You definitely could've fooled me! 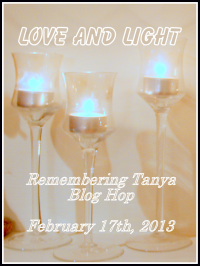 Lovely work and your blog is so pretty and stunning! Amazing you did not make a cuff like this before!! Wonderful work!! Be proud of it!!!! That bracelet is just amazing! I love what you made with your beads! My favorite is the bracelet! I love the texture in your woven piece! Great job and great soup! Cheers! Wow, Rivers Running is simply wonderful! 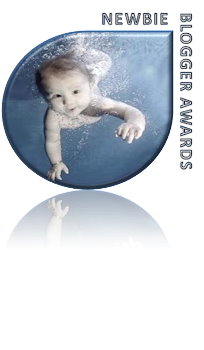 I like these wonderful shades of blues and greens - and you've made something very special with them! wow, that woven piece turned out nice. sure it was a lot of work! I really love the colors! You did great, love the bracelet, but you did wonderful with the necklace too! Wow, that bracelet is beautiful. You did a wonderful job mastering bead weaving. Cheers! Your pieces are so much fun! The necklace is simple and pretty...enjoy wearing them! The bracelet is gorgeous; your beadwork is amazing! I really like the handmade clasp that you added-really nice touch. Necklace is very fun as well. Nice work! Love the woven bracelet, the colors are beautiful together! You did an awesome job! Nicely done! I love all those blues and greens you've mixed them so well, nicely done! Isn't it so much fun when you can amaze yourself with one of your own creations? :-) It's lovely and so deserves that amazement! I love the name you chose—it really does look like a river... sparkling in the sunlight. Love your necklace too! Absolutely adore your bracelet! The necklace is wonderful too - great job! I love the bracelet, the colors are stunning and the clasp is beautiful too! Stunning bracelet...Very pretty necklace also..:) Bracelet is lovely! That bracelet is drop dead gorgeous! And I love how you hung the focal in the necklace! So pretty! This is a really nice set! My favorite color scheme of all time so both pieces really appealed to me. I especially like the necklace with the crystal ring as the focal. Terrific piece - love the ocean color combination! The bracelet is great. I love the colors and all the embellishments! Fantastic job! I like the bracelet, it has great texture! What a fun story Dee - your pieces are indeed a vision of water, love the colours and the design on both. wow! those are beautiful pieces! i'm particularly blown away by your bracelet! such patience! and such a stunning result! i had a little giggle about the focal. Both of your pieces are definitely bead soup blog hop worthy. But, I do understand that initial hesitation and worry over jumping in with the big leagues! You totally did it justice. While both of your pieces are beautiful, that bracelet is amazing. I can't believe you've never done any bead weaving before. Outstanding! Love both of your pieces...really pretty! That is just the pretties RAW bracelet ever...and in my favorite colors, no less! Great job!